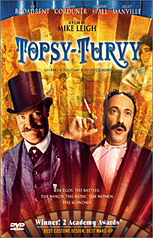 If you go to the main menu of this Gilbert & Sullivan biopic, you will notice that the disc features music under the menus. In the case of the main menu, it is only a short looping segment, but on other selective menu screens you will be able to find entire songs from the film playing. Go to the '"Language Selection"', the "Special Features"', the 'TV Spots' menu or the 'Cast and Filmmakers' menu you will be treated to some complete song highlights from the movie in beautiful Dolby Digital quality.